Charlton Athletic's Krystian Bielik was incredibly unlucky. Fans who run out on the field during a game are usually harmless drunks who consumed a bit too much or people who want to go viral for whatever reason or they want to get closer to their favorite athlete. They don’t usually bust on the field to hurt someone, although the risk of that happening makes it illegal. In League One, the third level of English soccer, Charlton Athletic took on Accrington Stanley. It wasn’t the prettiest soccer played this weekend; both teams had a player sent off due to violent conduct and it was a 0-0 stalemate for the first 90 minutes. Then there was a break in the game as Accrington Stanley’s Will Wood was whistled for a handball in the box. On the ensuing penalty, Karlan Grant converted and some fans took to the pitch to celebrate with the players on the sure win. 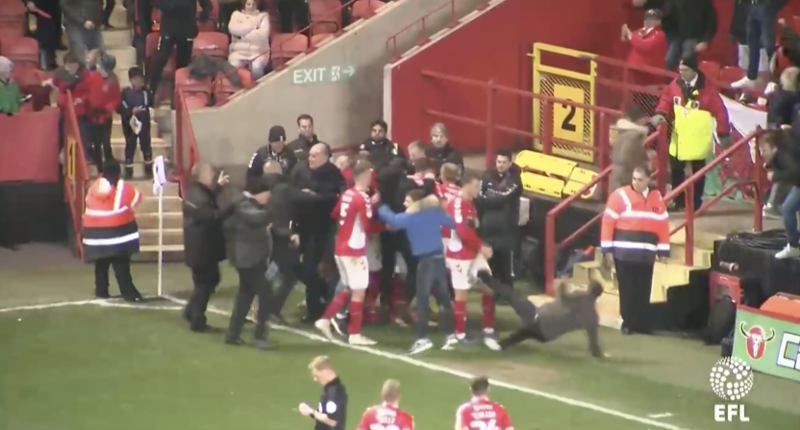 As security did their best to keep players off the pitch, a Charlton fan who was running late, ran up to the huddle, slipped and put their boot right into the groin of midfielder and Arsenal loanee Krystian Bielik. Definitely a red card tackle for the fan. The fan immediately knows what he did and tries to help Bielik but Bielik is busy rolling around in agonizing pain. Bielik eventually walks it off with the rest of the team as they go back to finish out the game. Charlton Athletic won 1-0.